Cornelius J. "Corny" Rempel: financial advisor and church worker; born 11 February 1912 to Johann G. Rempel (29 August 1878, Rosenthal, Chortitza, South Russia - 26 May 1957, Kitchener, Ontario, Canada) and Justina (Riediger) Rempel (1 December 1882, Chortitza, Chortitza Mennonite Settlement, South Russia - 7 December 1958, Kitchener, Ontario, Canada) in Millerovo, South Russia. He was one of six children in the family, two of whom died in early childhood. In 1924, Cornelius and his family immigrated to Ontario, Canada, where they settled first in Vineland before moving to Kitchener where he lived most of his life. On 3 August 1938 Cornelius married Marguerite Baerg (24 July 1915, Tiege, Molotschna, South Russia - 4 August 2007), daughter of Cornelius Johann Baerg (1874-1955) and Elisabeth (Unruh) Baerg (1876-1972); they had three children, Carol, Paul and Betsy. Cornelius became ill in early in 1994 and died of a heart attack on 13 January 1994 in Kitchener. The funeral was held at the Kitchener Mennonite Brethren Church on 16 January 1994. Upon completing high school in Kitchener, Ontario, Cornelius obtained work at the Waterloo Trust Bank (later Canada Trust). As trust officer, he specialized in mortgages, wills, and estates, a field he later used extensively in various church positions. Cornelius became a Christian early in life and was a dedicated and enthusiastic member of his local church, Kitchener Mennonite Brethren where he served on the church council for many years. He was also committed to the larger church community, especially the Conference of Mennonite Brethren Churches in the area of financial guidance. After several years of working in finance, Cornelius became the first director of the Mennonite Central Committee Canada office in Kitchener. Marguerite was always a part of Cornelius’s service as together they pioneered work from the new MCCC headquarters from 1944 to 1951. Much of their task in these years involved helping Mennonite immigrants coming from Europe after World War II. It also involved hosting and boarding the volunteers coming to work at the Kitchener office. 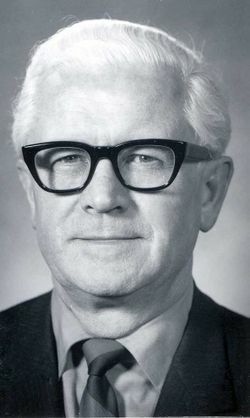 When the Historic Peace Church Council of Canada was formed in 1959, Cornelius represented the MB conference as secretary on the three member executive. In addition to his career, Rempel volunteered his time extensively. As chair of the K-W Red Cross Association, he established the first blood donor clinic in the area. He also volunteered for Children’s Aid, was president of the local Gideons chapter, and chaired the board of the Bethesda Hospital. In 1962 he was deeply involved in planning the Mennonite World Conference meetings held in Kitchener. Cornelius was part of the Ontario Peace Commission and a member of the Canadian Peace Commission for 16 years. In addition, he was on the General Welfare and Public Relations Committee of the General Conference of MB Churches from 1951 to 1966. After his retirement, Cornelius traveled extensively, when he served as an asset and legacy adviser for the Canadian MB Conference's Board of Stewardship from 1977 to 1985. For a time he was the Canadian MB Conference Board of Management representative. From 1975 to 1983 Cornelius was the Canadian MB Conference secretary and from 1972 to 1978, the General Conference of MB Churches conference secretary. Even with all of his travels and meetings, Cornelius still took time for music. He sang in his church choir for over 50 years, until his death. For almost 40 years, he sang baritone in the Sacred Song Quartet, which he helped form. For many years he was the announcer for his church”s "Dienst am Evangelium" radio program. Last but not least, Cornelius engaged in various athletic activities, including golf, tennis and baseball. Cornelius Rempel was a dedicated church worker who used the skills he had gained from his career in banking to serve the church throughout his life. In the many committees in which he participated, he helped support the work of the church, an example of faithful service to the children and grandchildren whom he loved dearly, as well as to friends and the people around him. Boldt, Ed. "Remembering Corny: C. J. (Corny) Rempel, 1912-1994." Mennonite Brethren Herald (15 April 1994): 30. Canadian Conference of Mennonite Brethren Churches. "Rempel, Cornelius J." Web. 7 April 2010. http://www.mbconf.ca/home/products_and_services/resources/published_genealogies/personal_papers/rempel_cornelius_j/. "Cornelius J. Rempel." Mennonite Brethren Herald (15 April 1994): 31. "Cornelius J. Rempel." Die Mennonitische Rundschau (19 June 1957): 1; (April 1994): 30. Cornelius J. Rempel. Hist. Mss. 1.191 (s.c.). Dates of creation: 1947-1949. Correspondence from C. J. to his family while travelling on behalf of MCC to Europe and Latin America. Mennonite Archives of Ontario. GRANDMA (The Genealogical Registry and Database of Mennonite Ancestry) Database, 6.02 ed. Fresno, CA: California Mennonite Historical Society, 2010: #160139. "Marguerite Rempel." Mennonite Brethren Herald 46 (September 2007). Huebert, Susan and Ed Boldt. "Rempel, Cornelius J. (1912-1994)." Global Anabaptist Mennonite Encyclopedia Online. June 2016. Web. 21 Apr 2019. http://gameo.org/index.php?title=Rempel,_Cornelius_J._(1912-1994)&oldid=142820. Huebert, Susan and Ed Boldt. (June 2016). Rempel, Cornelius J. (1912-1994). Global Anabaptist Mennonite Encyclopedia Online. Retrieved 21 April 2019, from http://gameo.org/index.php?title=Rempel,_Cornelius_J._(1912-1994)&oldid=142820.